What is an Invitation to Bid? An invitation to bid form is used to invite various parties such as contractors, suppliers, and buyers to submit a formal bid on a service, product, or property project. An invitation to bid (ITB) form is used to invite various parties such as contractors, suppliers, and buyers to submit a formal bid on a service, product, or property project. Sometimes referred to as a sealed bid, this competitive solicitation requires bidders to list the price for completing the proposed services as well as the bidding party's experience, availability, and estimated completion time. This process allows the buying party to choose the most qualified and cost-effective bid for their project. The invitation to bid template will have areas for unique bid information. You should include the details of the project or service and use each section to request information from the bidding parties. This will ensure that all the appropriate information is gathered so the requesting party can make an informed decision about the best offer. An invitation for bid (IFB) is used when there is no difference between the products or services that meet the specifications. The only difference among the bids will be the price and the lowest bid will win the contract. In a request for proposal (RFP), price is only one of the evaluation criteria that is used to select a winning bidder. A RFP will also outline the method that a bidder plans to use to solve your company’s problem. Create a free Invitation to Bid in minutes with our professional document builder. Invitations to bid are useful when the party that is seeking the bid has a thorough understanding of the work that needs to be done and the process that is necessary to complete it. In these circumstances, price is the determining factor. Projects that often use this bid solicitation process include infrastructure projects such as the construction of highways or bridges. United States federal, state, and local laws often require that governmental organizations use this process to create a transparent process that prevents favoritism and corruption. This process is also often used by academic institutions. Open tenders - Also known as open calls for tenders, or advertised tenders. These are open to all potential vendors and contractors that meet submission requirements and can guarantee performance. Restricted tenders - Also known as restricted calls for tenders, or invited tenders. These are open to only a select group of prequalified vendors or contractors who meet a set of minimum qualifications. This may be part of a two-part process: the first step is an expression-of-interest (EOI) tender call that produces the list of vendors that are qualified to participate in the second part. Double envelope system - This system separates the technical proposal from the price proposal. The two proposals are kept in two separate and sealed envelopes. When the evaluator is choosing the winning proposal, they consider the technical proposal first and then look at the price. This system is intended to ensure a fair evaluation of the technical merits of a proposal, without being influenced by its cost. Tender box - This system uses a mailbox to receive bids. This tender box is open for interested parties to submit their bids during the period of time that proposals are being accepted. Once the bidding period is over, the tender box is seal shut and can only be opened by the evaluation committee or a member of the procurement management department with two witness. Governmental organizations are often legally obligated to publicly announce tenders for work and services. These will typically be published on their websites and printed in their newsletters. Electronic procurement and tendering systems or e-procurement systems are also commonly used. There are numerous companies that offer subscription services to alert their subscribers when invitations to bid are open. 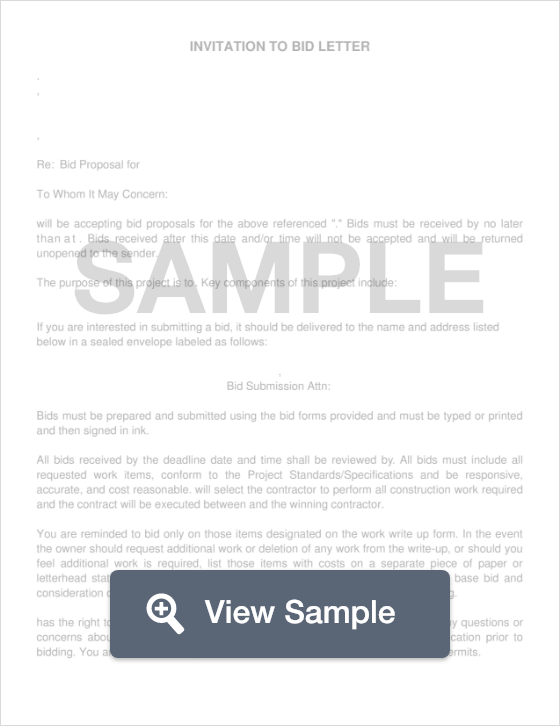 An invitation to bid is a document that invites a contractor or subcontractor to submit a bid to perform certain work. An invitation to bid should include the cost of supplies and labors for the tentative work. Non-disclosure agreements are important legal documents trusted by businesses to protect their business secrets. Non-disclosure agreements are usually signed at the beginning of the working relationship. The purpose of a Scope of Work document is to outline a project from start to finish. Scope of Work explains each step in detail while also outlining any reporting that must be done throughout the life of the project. A Durable Power of Attorney makes preparation for any anticipated incapacity to express one's own wishes in the future. It names the person who is acted for and the appointed authority. It specifies areas of decision making for which power is delegated.